Alexander Petersen is probably a name most poker fans haven’t heard of before. But that’s likely to change with his startling come-from-behind tournament victory on the biggest stage in poker this evening, when he won his first World Series of Poker gold bracelet. The Danish poker pro win the $10,000 Pot-Limit Omaha World Championship, which was played out over the last three days and completed at the Rio in Las Vegas. The Pot-Limit World Championship attracted 387 players, which created a $3,537,800 prize pool. The top 40 finishers collected a payout. Petersen plowed through a tough final table, and left the runner up Jason Mercier shaking his head from an absolutely bizarre turn of events in the closing stages of heads-up play that dumbfounded all witnesses for how quickly the chip lead and outcome was reversed. Petersen was behind in chips by about a 3 to 1 margin when heads-up play commenced, then quickly doubled up, and before the chips had been re-stacked he had Mercier all in and covered holding what turned out to be the winning hand. 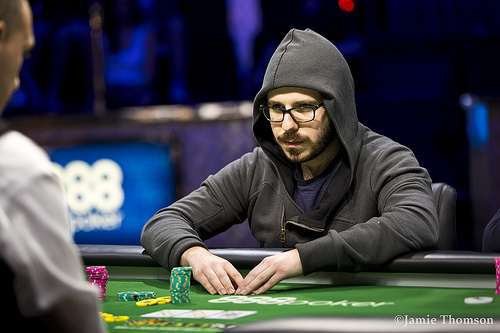 Meanwhile, Mercier on the verge of winning his second gold bracelet of the summer was instead left with disappointment, inasmuch as a $572,989 consolation prize can be considered a blow. For his victory, the first major live tournament win of Petersen’s career, he raked in a whopping $927,655 in prize money. This was one of the largest top cash prizes of the series, so far. Remarkably, this marked Petersen’s first time to cash at the series. 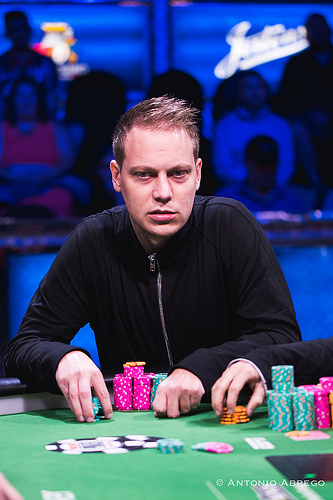 Even though he’d come and previously played at the WSOP, the 31-year-old Dane never really took the live tournaments seriously, instead opting to play and have fun in Las Vegas. Nonetheless, Petersen is no stranger to poker or success in the game. He’s relatively unknown in live settings because virtually all of his accolades have taken place online. Petersen has been a full-time professional poker player for 11 years, and has specialized in online Pot-Limit Omaha cash games for the past 7. Hence, he was beyond experienced at this level and arguably arrived at this final table as the player who had played more Pot-Limit Omaha hands than anyone else. Petersen’s early poker background is just as interesting. He started playing online while in business school. He even worked as a computer programmer and helped to design home pages. Then, he discovered poker and started playing. Once he found online poker, Petersen came to learn that as he got better at the game and continued to increase his level of skill, he started winning more. Petersen has played in several European Poker Tour events in the past, with some cashes, but nothing on the scale of a WSOP victory. No less than four of the nine final table players had previously won gold bracelets, including Hasan Habib (1 win), Shaun Deeb (1 win), Davidi Kitai (3 wins), and Jason Mercier (3 wins). However, in the end it was an online specialist who came out of nowhere who obliterated the dreams of several other experienced players and walked away with the title and the coveted gold bracelet. When asked about what plans he has for the huge financial boost, Petersen was a little less enthusiastic. 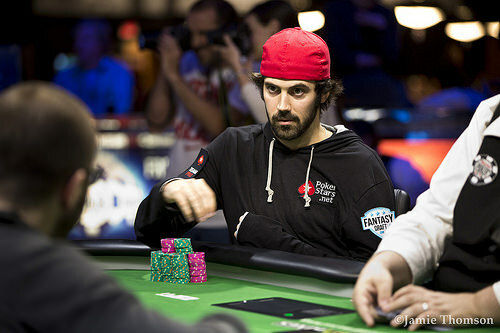 Second Place: Jason Mercier, from Davie, FL finished in 2nd place, which paid $572,989. Mercier almost became the third player of this year’s series to win duel gold bracelets (Max Pescatori and Brian Hastings were the others). However, his hopes crumbled in the final stage of this tournament, much of Petersen’s delight. Mercier, who won WSOP titles in 2009, 2011, and 2015 collected $572,989, which was the third-best score of Mercier’s career at the WSOP. His career winnings at the annual series now totals in excess of $3.5 million. Third Place: Dan Smith, from Las Vegas, NV finished in 3rd place, which paid $369,564. This marked his second time to finish 3rd at this summer’s series. He took the same spot earlier in the Deuce-to-Seven Lowball Championship. Smith now has 22 cashes and more than $1.4 million on his WSOP resume. Fourth Place: Simon “Aces” Trumper, from Nottingham, UK finished in 4th place, which paid $267,778. 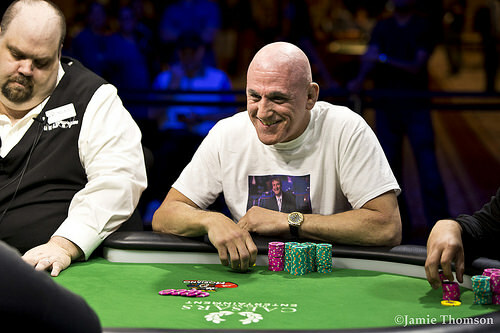 This marked Trumper’s deepest run at the WSOP in 13 years. The bombastic poker pro, who appeared on numerous televised events in the past, has been one of England’s most colorful personalities for many years, but still remains without a gold bracelet. Fifth Place: Mohsin Virani, from El Dorado, AR finished in 5th place, which paid $196,877. Remarkably, this was his first time ever to cash at the WSOP. Sixth Place: Steven Reichardt, from Hamburg, Germany finished in 6th place, which paid $146,857. This was Reichert’s second time to cash at the series. Seventh Place: Davidi Kitai, from Brussels, Belgium finished in 7th place, which paid $111,134. He’s a three-time WSOP gold bracelet winner, with wins in 2008, 2013, and 2014. Kitai is now one WSOP win behind Max Pescatori among European poker players with the most WSOP victories. However, he’s the biggest winner in WSOP history ever from Belgium, with 24 cashes and more than $1.6 million in series earnings. Eighth Place: Shaun Deeb, from Troy, NY finished in 8th place. He won a gold bracelet earlier in 2015, and was hoping for a second victory. This would have been a double whammy of a WSOP had Deeb won, especially since his previous victory was in the $10,000 buy-in Pot-Limit Hold’em championship. Instead, Deeb had to settle for a payout totaling $85,306. Ninth Place: Hasan Habib, originally from Pakistan and now from Downey, CA finished in 9th place, which rounded out the final table. He collected $66,463. Habib won his gold bracelet back in 2004. He also finished 4th in the 2000 WSOP Main Event Championship. Aside from the final table finishers, other gold bracelet winning players who cashed included – Brian Rast (30th), Sorel Mizzi (37th), and William Kakon (40th). Tony “Top Cat” Cousineau cashed yet again (31st), which is the 72nd in-the-money finish of his career. It’s also his fourth cash at this year’s series. Cousineau is the all-time cashes leader in WSOP history without a gold bracelet victory. Pot-Limit poker made its WSOP debut back in 1984, when two Pot-Limit Omaha tournaments were offered. There were no Pot-Limit tournaments of any kind played at the WSOP from 1970 through 1983. The only Pot-Limit variety which was played at the WSOP between 1984 and 1991 was Pot-Limit Omaha. Pot-Limit Hold’em action was restricted to cash games. Alexander Petersen Wins The $10,000 Pot-Limit Omaha World Championship! Jason Mercier limps from the button and Alexander Petersen raises to 300,000 from the big blind. Mercier calls and the two see a flop of . Petersen leads for 600,000 and Mercier pushes his last 1,200,000 in the middle. Petersen calls and the cards are tabled. Mercier leads with two pair but has to fade the many outs of Petersen. The on the turn gives Petersen a flush and the on the river does not fill up Mercier meaning he is out in second place. Mercier earns $572,989 for his second place finish. This is Mercier's fourth cash of the World Series. 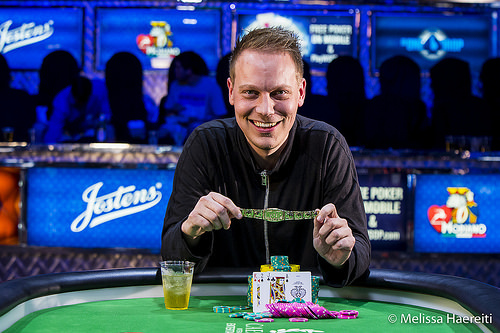 Petersen wins $927,655 for first place and the WSOP gold bracelet. Alexander Petersen raises to 300,000 on the button and Jason Mercier calls. The dealer spreads a flop of and Mercier checks to Petersen. Petersen fires out 300,000 and Mercier immediately raises "pot" to 1,500,000. Petersen thinks about it for over 30 seconds and eventually calls. Petersen sticks his hands out in front of his face and asks they not announce the turn card. The dealer burns and turns the and Mercier moves all in. Petersen sees the turn and snap calls. Petersen flopped the nuts and just has to fade a river club. The hits the river and Petersen doubles up to just shy of ten million. Mercier is crippled. Jason Mercier limps from the small blind and Dan Smith raises to 300,000. Mercier calls and the flop comes . Mercier checks to Smith who bets 250,000 and Mercier min-raises to 500,000. Smith looks at his stack and shoves the remaining 600,000 in the middle. Mercier snap-calls and shows for the nut straight. Smith has meaning he needs a for a chop, or running full house cards. The turn is the and the river is the leaving Smith drawing dead and eliminated. 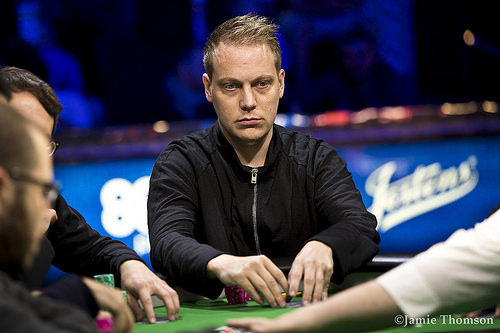 Alexander Petersen limps from the small blind and Jason Mercier raises the action to 300,000. Petersen calls and the two see a flop of . They both check and the hits the turn. Petersen bets 475,000 and Mercier calls which brings the on the river. Petersen bets 500,000 and after a second of contemplating, Mercier calls and see Petersen's for a rivered straight. Alexander Petersen raises the button to 200,000 and Dan Smith calls from the big blind. The dealer fans out a flop of and Smith checks to Petersen. Petersen tosses out a bet of 200,000 and Smith calls. The turn brings the and Smith checks for a second time. Petersen announces "pot" betting 850,000 and Smith releases his hand. Jason Mercier raises to 200,000 on the button and both players tag along from the blinds. The dealer spreads a flop of and both Smith and Petersen check-fold to a bet of 140,000 from Mercier. Alexander Petersen limps from the small blind and Jason Mercier checks his option. The flop is and Petersen check-calls 115,000 from Mercier. Petersen checks again on the turn and Mercier fires 265,000. Petersen check-raises Mercier to 675,000. Mercier thinks for a few minutes before finally giving up his hand and shipping the pot over to Petersen. Jason Mercier raises from the button to 200,000 and finds a caller in Alexander Petersen in the big blind. The flop comes and Petersen checks to Mercier who bets 240,000. Petersen calls and the falls on the turn. Both players check and the comes on the river. Petersen checks again to Mercier who bets 415,000. Petersen says he does not think he can not lay his hand down and calls. Mercier shows him for two pair and takes the pot. Simon Trumper limps from under the gun and action folds to Alex Petersen who decides to limp from the small blind. Mercier checks his option from the big blind and the three see a flop of . Both blinds check to Trumper, who continues for 175,000. Petersen quickly folds and Mercier announces "pot", raising to 825,000. Trumper moves all in and Mercier snap calls. Mercier is ahead with his flopped set, but will have to dodge any spade, running straight cards, or the one king remaining in the deck. The on the turn provides Trumper with additional outs, needing any queen to improve to broad way. The hits the river and Trumper is sent to the rail in 4th place. Alexander Petersen raises the button to 200,000 and action folds through to Simon Trumper in the big blind who announces "pot" raising it to 650,000. Petersen calls and the two see the dealer spread a flop of and Trumper immediately moves all in for his last 1,200,000. Petersen folds and Trumper rakes in the pot. Jason Mercier limps from under the gun and calls a 250,000 raise from Alexander Petersen. The flop is and they both check. Petersen bets 300,000 on the turn. Mercier goes into his stack and comes out with a raise to 840,000. Petersen quickly folds and Mercier takes the pot. Alexander Petersen raises to 200,000 from under the gun and Dan Smith defends out of the big blind. The dealer spreads a flop of and Smith checks to Petersen, who checks behind. Both players see the hit the turn, and Smith takes the opportunity to lead out for 275,000. Petersen quickly calls and the two see the fall on the river. Smith checks and Petersen checks back. Smith rolls over for a straight and takes down the pot. Players are now on a 15 minute break. Jason Mercier limps the button for 80,000. Simon Trumper calls the small blind and Dan Smith tags along from the big blind. Action is checked to Mercier on the flop and he bets 140,000. Trumper is the only caller and the comes on the turn. Trumper checks and Mercier bets 405,000. Trumper calls and the comes on the river. They both check and Mercier shows for a straight to take down the pot. Dan Smith limps the button with Alexander Petersen limping from the small blind and Jason Mercier checking his option. The flop comes and all three players check. Petersen bets the turn to the tune of 130,000 and Mercier calls. Smith folds and the hits the river. Petersen bets 200,000 and Mercier raises the action all the way to 740,000. Petersen sends his cards into the muck and Mercier takes the pot. Mercier Loses Back to Back "Pots"
Jason Mercier raises to 160,000 on the button and action folds to Dan Smith in the big blind. Smith thinks about it briefly before announcing "pot", raising to 520,000. Mercier mucks his hand and Smith takes down the pot. Mercier soots a look over towards his rail. "What did he have? I want to know in thirty minutes. I made it 160,000, he made it 520,000. Unless I'm not in, then I really don't care." Smith and Mercier share a laugh. On the very next hand Mercier raises to 160,000 from under the gun and Alexander Petersen calls out of the big blind. The two see a flop of and Petersen checks to Mercier, who continues for 185,000. Petersen slides forward a tower of yellow 100,000 chips, raising pot, and Mercier quickly folds. Simon Trumper raises to 160,000 on the button and Alexander Petersen calls from the big blind. The flop comes and Petersen check-calls for 200,000. They both check the turn. Petersen bets 200,000 on the river and Trumper picks his cards up to look at them while holding calling chips in his other hand. After a moment, he drops the chips in and Petersen shows for a straight to take the pot. Trumper shows the and mucks.